On a gray, chilly Tuesday afternoon at Chicago’s Wrigley Field, the Cardinals opened their 1991 season with a textbook example of how playing fundamental baseball _ the George Kissell way _ can bring a positive result. Relying on effective pitching, good base running, plate discipline and timely contact, the Cardinals beat the Cubs, 4-1, on April 9, 1991. Cardinals manager Joe Torre sent the game ball and lineup card to Kissell, the club’s long-time instructor. “Kissell gets this for teaching the Cardinals organization how to play baseball,” Torre told the St. Louis Post-Dispatch. 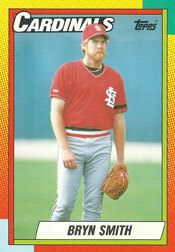 Bryn Smith, 35, a nine-game winner for the 1990 Cardinals, was the starting pitcher for St. Louis in the 1991 opener. Torre selected a batting order of center fielder Rex Hudler, shortstop Ozzie Smith, left fielder Bernard Gilkey, first baseman Pedro Guerrero, right fielder Felix Jose, third baseman Todd Zeile, catcher Tom Pagnozzi, second baseman Jose Oquendo and Bryn Smith. Cubs manager Don Zimmer chose Danny Jackson as his starting pitcher. Chicago’s lineup featured a pair of future Hall of Famers, second baseman Ryne Sandberg and right fielder Andre Dawson, and standouts such as first baseman Mark Grace, shortstop Shawon Dunston and left fielder George Bell. The Cardinals scored first in the fifth. With the bases loaded and two outs, Gilkey fell behind in the count 0-and-2 before drawing a walk, scoring Pagnozzi from third. The full-count pitch from Jackson to Gilkey “missed inside by a few inches,” according to the Chicago Sun-Times. Dunston led off the bottom half of the inning with a home run, tying the score at 1-1. In the eighth, the Cardinals struck for three runs, using a walk and three ground balls that never left the infield as their weapons. With the bases loaded and one out, Paul Assenmacher relieved Jackson. Oquendo hit a dribbler toward the left side of the infield. “I broke my bat in three pieces,” Oquendo said. The ball eluded Assenmacher. Dunston raced in from his shortstop position, grabbed the ball and flipped it to second. Pagnozzi beat the toss. Jose streaked home from third on the fielder’s choice play, putting the Cardinals ahead, 2-1, and the bases remained loaded. Torre sent Craig Wilson to hit for Bryn Smith. Wilson slapped a grounder toward the mound. Assenmacher reached for it and the ball deflected off his glove toward Dunston, who had no play. Zeile scored from third, putting the Cardinals ahead, 3-1. Wilson was credited with a RBI-single. The bases still were loaded. “We’ve got the guy (Zeile) at home if I don’t touch it, but the reflex is to go for it,” Assenmacher said. Zimmer yanked Assenmacher and replaced him with Les Lancaster. Hudler grounded to Dunston, whose spikes “stuck in the moist dirt,” the Sun-Times reported. Instead of an inning-ending double play, Dunston settled for a force of Wilson at second, with Pagnozzi scoring from third. The Cardinals’ bullpen protected the 4-1 lead. Mike Perez pitched a scoreless eighth and Lee Smith earned the save with a scoreless ninth. “I’m glad I’m playing with this bunch of runts,” Lee Smith said of the Cardinals.